Parenting (and music lessons!) can sometimes feel like a lonely endeavor. But you aren’t alone. Just like you, we know the day-in, day-out ups and downs that come not only with raising kids, but with combining parenting and the Suzuki Method. We founded Adventures in Suzuki Parenting because we wanted to share awesome resources, training, inspiration, and more with Suzuki parents like you. We’ll share our good days and bad days. We’ll be real. Adventures in Suzuki Parenting is here to connect you with Suzuki families around the world. Twinkle by Twinkle, note by note, day by day, together we will strive to do our best as parents. Because, after all, parenting is an adventure. And Suzuki is a great spice. She’s a Suzuki teacher. He’s a writer. Together, wife-and-husband team Jodie and Anthony St. Clair are a couple of practice-sharing, homeschooling, lifelong-learning, world-traveling, making-all-the-things parents of a Suzuki son and daughter in Eugene, Oregon. They started their Suzuki parenting journey in 2011. Outside of teaching and homeschooling, Jodie loves to paint, sew, knit, garden, and plan new adventures for her little family. 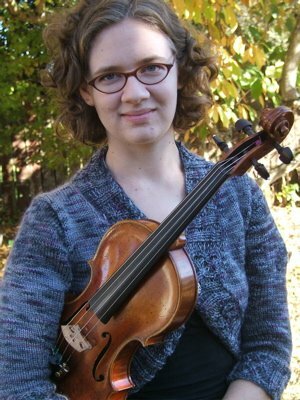 Learn more about Jodie’s violin and SECE programs at EugeneSuzukiMusic.com. Anthony St. Clair shared Suzuki Early Childhood Education (SECE) classes with his son and daughter from when they were newborns until age 3.5, when they graduated to violin. When not being their practice partner, Anthony is a writer, author, home cook, and hygge-loving hobbit. Learn more about Anthony, his books, and his other work at anthonystclair.com.